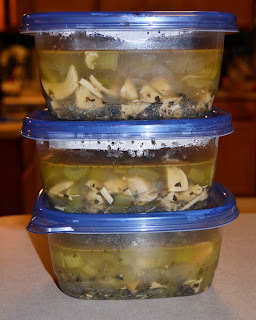 My HCG Cooking Blog - Favorite recipes and discoveries on my HCG weightloss journey: P2 Chicken Soup - Comfort Food! This post may contain affiliate links to products on amazon.com. When you click one of these links and make a purchase, I will receive a small commission, at no cost to you, that enables me to continue providing free recipes. Thank you! 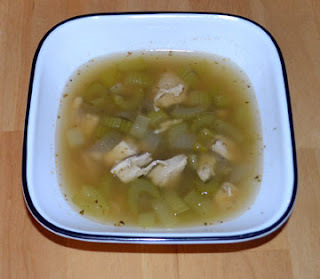 Home » Sugar Free » P2 Chicken Soup - Comfort Food! P2 Chicken Soup - Comfort Food! Whether it's cold outside, you aren't feeling 100%, or you just want some good ole comfort food, it's hard to beat homemade chicken soup! This is an easy one to make in bulk so you have some meals ready to go in the fridge or freezer. Heat chicken broth in sauce pan. Add onion and celery and cook for about 5 minutes. Add seasonings and chicken, let simmer until chicken is done. Taste and add water as needed until it's just right. I quadrupled this recipe so I have 3 more meals ready to heat. I ordered a bulk package of gladware containers - these for meals like this, and some smaller ones for freezing meat portions. I am in P2 -Cooked this recipe yesterdayrainy and cold day, perfect day for a warm soup and a break from grilled chicken and salad... , substituted whatever i had in the fridge, red pepper, onion, lettuce all chopped and sauteed, 2 chicken breast cubed, 1 tomato, salt, cumin, chopped garlic, cilandro and chicken soup base...came out very good!!! It feeled me up nice, and warmed my stomach.Counted a soup bowl 1 protein and 1 vegetable, this recipe is a winner, thank you!! Quick question, I see you mince an onion on a lot of your recipes but then you have another veggie that you count as your 1 veggie. Can you explain how this works & is ok? I would love to know I can mince an onion and not have it count for my 1 veggie! I add chopped cabbage and cayenne pepper. It works for me that way, it has never caused a slow down. I have also used left over grilled chicken with lemon pepper before, it added more flavor. Did you make your own broth? I've checked a lot of broths, and they all seem to have sugar listed on the ingredients. I'm sure it isn't much, but just wondered what you used. Hi! I didn't on P2, no, because I wanted the least amount of fat on P2. I used Swanson broth and in the large carton it lists 1g of sugar but it isn't in the ingredients, so I think it must be from some of the veggies used to make the broth. I'm ok with it. As long as sugar isn't listed at all in the ingredients I feel ok about using shortcuts (of course monitoring to make sure they don't cause a gain). Can you substitute the chicken with lean grass feed beef like a stew? Making this tomorrow ! Thanks ! quick question: how do you equally seperate them into 2 or 3 servings ? I feel like my meat portions are all of when I seperate. Today I made beef chili and I thought I halved it but when I was packing my lunch for the other half, seemed like there was a lot more beef in it. I added green peppers in it too. Do you just eye ball it ? I made this recipe tonight. I used an eight ounce carton of no salt no fat chicken broth and added about 6oz of water. 2 cups of cabbage and spices and 3.5 oz chicken. I hope I don't slow down I have been doing so good. They soup was delicious!! Your recipes are the bomb!! Do you have a website?? My HCG Cooking is a participant in the Amazon Services LLC Associates Program, an affiliate advertising program designed to provide a means for sites to earn advertising fees by advertising and linking to amazon.com.